Stuttgart, GERMANY, 2019-03-26 – Vector is adding the new tool vFlash Remote to complete its Vector Remote Diagnostics solution which consists of the diagnostic tester Indigo Remote and the Remote D-PDU API. vFlash Remote now gives diagnostic users the option of flashing ECUs remotely, independent of location. Users benefit from high degrees of flexibility and reliability, especially on vehicle test drives and offshore production plants. vFlash Remote makes it easy to reprogram ECUs remotely – entirely independent of location and without much organizational effort or cost. It is extremely easy to set up the communications infrastructure. 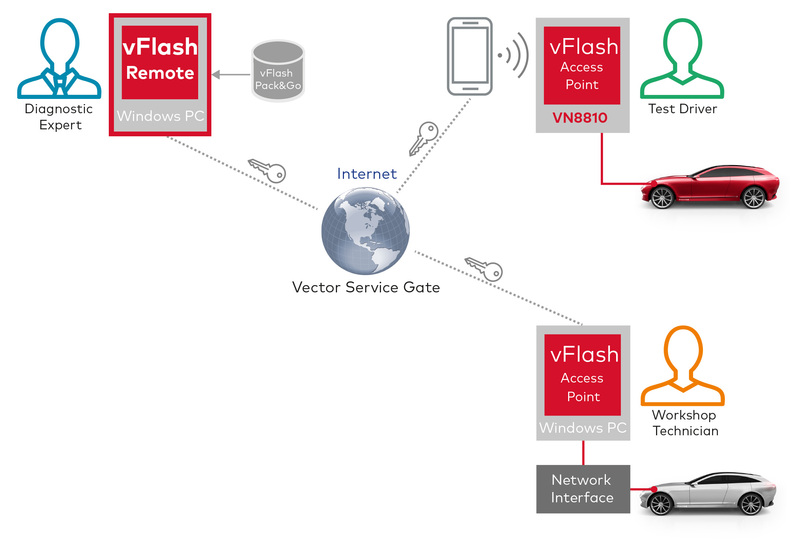 The user uses vFlash Remote as the flash tool and connects to an access point on the vehicle remotely over the Internet. In turn, two possible pathways are available for the remote interface: either simply via the intelligent VN8810 Diagnostic Device which already integrates the vFlash Access Point or via a Windows-based PC with an installed vFlash Access Point and network interface. The vFlash Access Point required for this can be downloaded free-of-charge from the Vector website. Users can also boost efficiency and reduce costs by reusing existing flash packs for remote applications which have already been created with vFlash. Along with the advantage of immediate availability, other product focal points include the security and reliability of the flashing procedure. The remote connection between vFlash Remote and the vFlash Access Point is always encrypted. This ensures that flash data cannot be seen or manipulated by third parties. Furthermore, the transfer of flash data to the Access Point is decoupled from ECU reprogramming. Reprogramming is not started until the data to be flashed has been fully transferred to the Access Point and has passed a plausibility check. The user gets added transparency from continuous display of progress information during the flash procedure, qualified status feedback after completion and optional generation of a report for documentation purposes. Vector is the leading manufacturer of software tools and components for the development of electronic systems and the related networks with a wide range of systems from CAN to Ethernet. Since 1988, Vector has been a partner of manufacturers and suppliers of the automotive industry and related sectors. Vector tools and services provide engineers with a decisive advantage to make a demanding and highly complex subject area as easy and straightforward as possible. Vector employees constantly strive for new electronic innovations for the automotive industry. Customers worldwide from the automotive, commercial vehicle, aerospace, transport and control engineering fields rely on solutions and products of the independent Vector Group when developing technologies for the mobility of tomorrow. Vector has a current staff of over 2,500 employees and achieved a turnover of 654 million euro in 2018. Besides the headquarters in Germany (Stuttgart), Vector has branch offices in the USA, Japan, France, Great Britain, Italy, Austria, Sweden, South Korea, India, China, and Brazil.